On Saturday August 29, Voice4Thought and Antilounge organise a smashing evening programme at the venue Gebr. De Nobel. In this programme it is all about the dialogue between artists of V4T and the Hague record label Antilounge. Martijn Verlinden (Antilounge, Rivers Area Juke Squad) and Edward van Eck (Generate) have contracted a unique collaboration with Croquemort (slam poetry artist, Chad). In addition, individual performances are held by Kazil, Raw Bros and Charly & Gallus (Antilounge) and Smockey (rap, Burkina Faso). The VJ abilities are from Simple Production, who will further explore the themes of the festival. Tickets can be bought online on the Gebr. de Nobel website. Croquemort aka Didier Lalaye is a well-known slam poetry artist from Chad. He moreover practises the profession of doctor and set up an e-health project in the fight against Bilharzia. He organised the SLAM festival ‘N’djam s’enflamme en slam’ in N’Djaména. Slam is a form of expression, poetry on melody. The words sing and debouch into a blossoming rhyme that contain the critique on and emotions of daily life. The reality in Chad is, since independence, defined by opposition and conflict. During the launch of the project V4T on November 27, 2014 (during LeidenGlobal Day), Croquemort held his first Dutch performance. 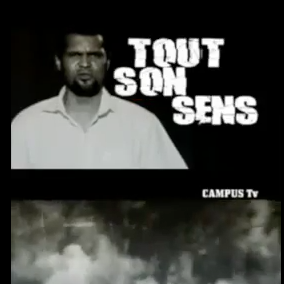 Serge Bambara or Smockey is a hip hop artist, actor and political activist from Burkina Faso. In 1991 he moved to France to study, where he signed a contract with EMI in 1999. He launched his first single with the singer Lââm. In 2001 he moved back to Burkina Faso and started with studio Abazon. By now he has released the albums Epitaphe, Zamana, Code Noir and Cravate Costards et Pourriture and he has collaborated with the leading Senegalese rapper Didier Awadi. He was a leader during the recent uprising in Burkina Faso that led to the fall of the president. Antilounge is thé Hague underground label with the objective to offer a platform for new and talented Hague electronic artists. It was founded in 2013 by Martijn Verlinden. Genres like elextro, dubstep, jungle, industrial, techno, grime, breakcore, worldcore, IDM, noise drones and terrorsalsa; all are represented at the Antilounge albums. Recent releases of the label are, inter alia, from Raw Bros, Generate and Alkaloid. The Voice4Thought is a part of the research programme ‘Connecting in Times of Duress’ and is co-organised by NOW, Leiden University, ASC, LeidenGlobal and Both Ends. Media partners are RNW media, VPRO Buitenland, The Broker and One World.